The 1970s view kitchen was in a home built by a contractor for himself. Details were not important to him. 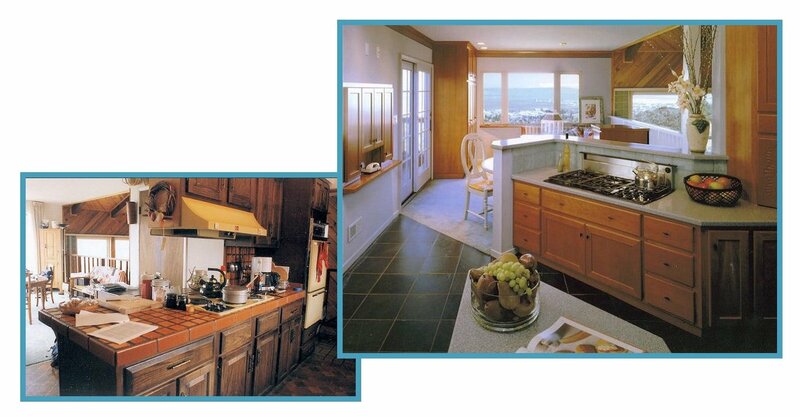 New homeowners needed an updated kitchen where they could cook and entertain, and enjoy the great view. A structural wall was removed to open up the kitchen. New custom cherry cabinets were installed, and the homeowners chose low-maintenance Corian countertops.The remodeled Scandinavian-influenced kitchen features a telephone niche that hides the family’s calendar and notes when not in use. Other features are three built-in bins for dog food, a built-in table for four on the back of the angled peninsula, and a built-in banquette that will easily seat eight.